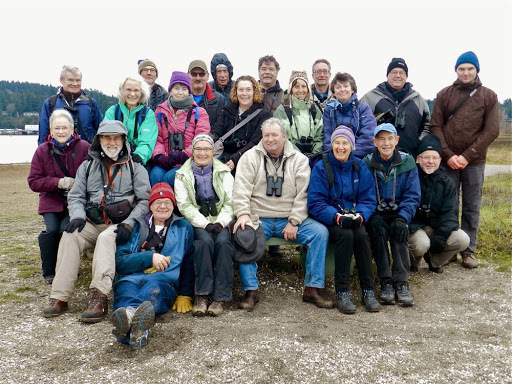 A large group of 21 DNCBers enjoyed a very pleasant and fruitful final 2013 outing to Blackie Spit and then the White Rock pier. Hi-lites included: Long-billed Curlew, Marbled Godwits, Long-tailed Ducks and a tasty feed at Uhli’s Restaurant in White Rock. Check out the photo evidence on the Picasa link to our website at DNCB Picasa site. Eight of us (Hans, Mike, PB Lorna, Mary-Pat, Otto, Glen, Terry and me) left Petra’s around 8:00 a.m. on Monday morning in a poor car-pooling convoy (4 vehicles). With little traffic, plus using the new SFPR, we got to the Blackie Spit parking lot well before the 8:45 a.m. schedule. 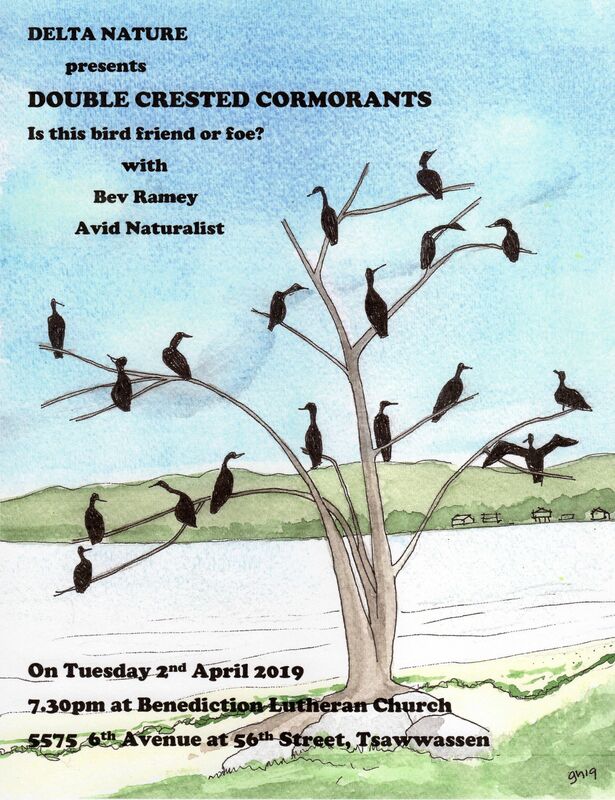 We were welcomed there by South Slurry Al, Ken & Anne, Bryan & Janet, Bev and her phantom hubby Bill, gift-bearing Marion, Jean, returnees Eric and Johnny Mac, Richmond’s Bill and Donna. Following introductions, we wandered through the entrance toward the Nicomekl River shore. Almost immediately we spotted our target birds, the Long-billed Curlew and three Marbled Godwits. 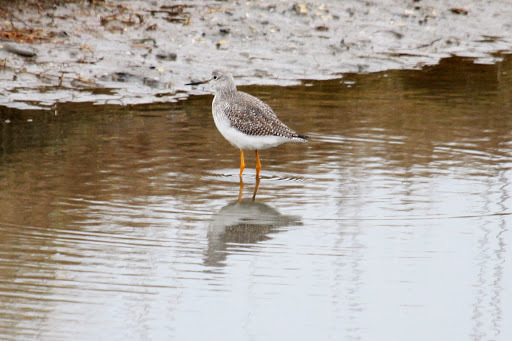 They were feeding among American Wigeons, Northern Pintail, Green-winged Teal with about a dozen Long-billed Dowitchers there too. 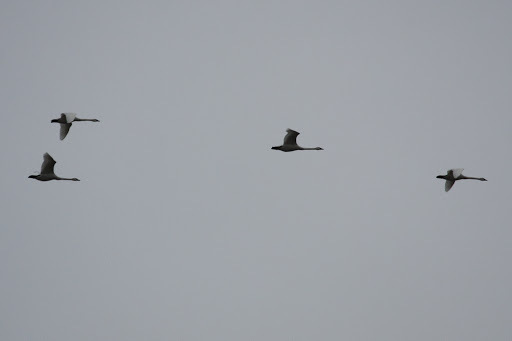 In the river were several Double-crested Cormorants (Pelagic seen later), a few Common Loons and Horned Grebes. The temperature was comfy, around 10 Celsius and the tide was high as it tends to be in Winter. Sparrows and a Northern Harrier in the grass. The mangled carcass/bones of a River Otter thrilled some of the weirdoes in our group. PB Lorna’s Belted Kingfisher eventually made an appearance and a neat flock of “trumpeting” Trumpeter Swans flew by above us. 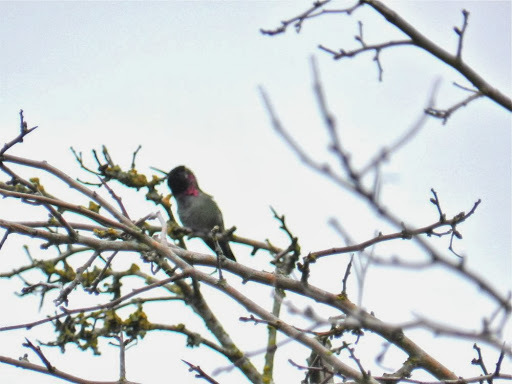 Walking further along toward the Community Gardens we finally saw a couple of Golden-crowned Kinglets and an Anna’s Hummingbird. 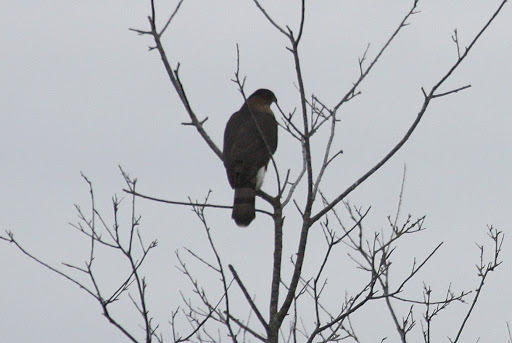 Then Bev scared up a Cooper’s Hawk which posed nicely for us on a shrub tree a bit further down. We begrudgingly paid for the parking at the White Rock pier, and got over the tracks before a train passed by. The Surf and White-winged Scoters were in beaut plumage and up-close-and personal. Among them were Bufflehead, Common Loons, Greater Scaup and Terry got shots of both Common and Barrow’s Goldeneye. 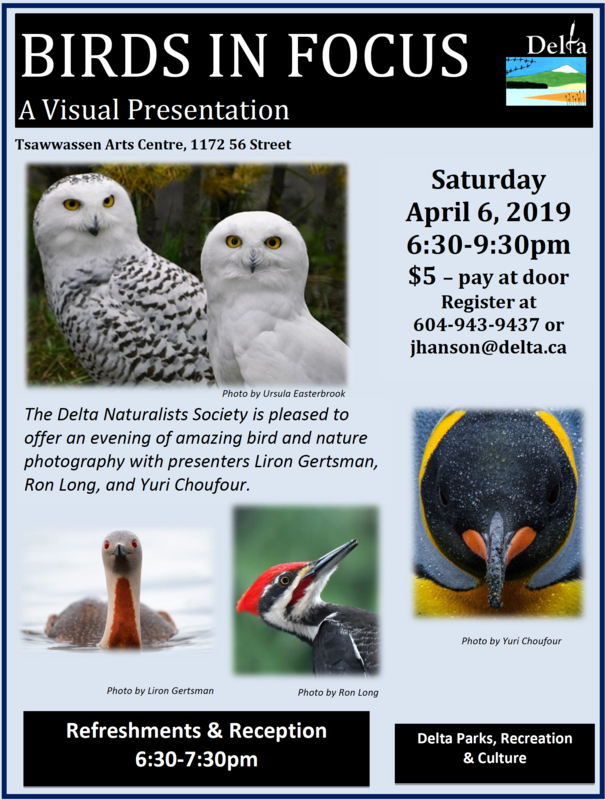 while watching Long-tailed Ducks and a Pied-billed Grebe. Nearing 12:30 p.m., eleven of us decided to celebrate another awesome DNCB morning with lunch at Uhli’s Restaurant, just across from the pier. Most enjoyed their soup, sandwich or hamburg; my fish & chips was forgettable, but the beer and conversation were delectable and demented, respectively. Terry and I got back to Petra’s around 2:30 p.m. and I had time to begin Sandra’s New Year’s Eve To Do List. 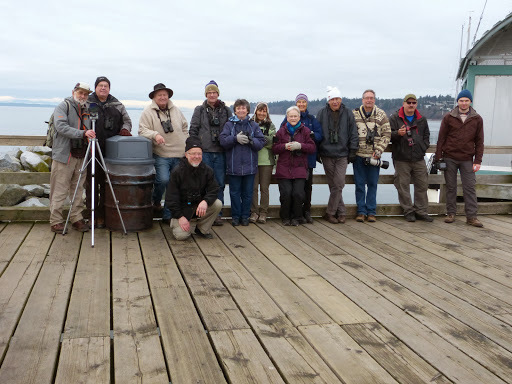 Next Monday, January 6, on our first 2014 outing, we will tour Drayton Harbour/Semiahmoo in Blaine, Washington. We’ll leave Petra’s at 8:00 a.m. and meet at Peace Portal Park parking lot behind the Duty-Free shop at 8:30 a.m. for car-pooling across the Border. Terry and South Slurry Al will lead us. Don’t forget your Passport. 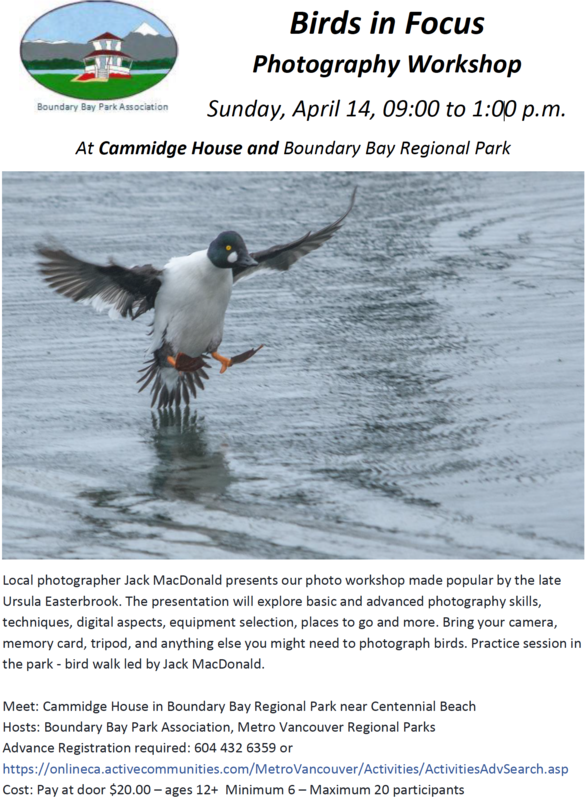 This entry was posted in Bald Eagle, Barrow's Goldeneye, Blackie Spit, Cooper's Hawk, Long-tailed Duck, Northern Harrier, White Rock Pier. Bookmark the permalink.